There’s a big incentive for molders of small medical parts to increase production efficiency by going to 16, 32, or even more cavities using hot runner/valve gate systems. Molders have always had great success with Eastman Tritan™ copolyester for medium-to-large components of medical devices and electronic instruments. Recently, our commitment to small, multicavity solutions began delivering big results. 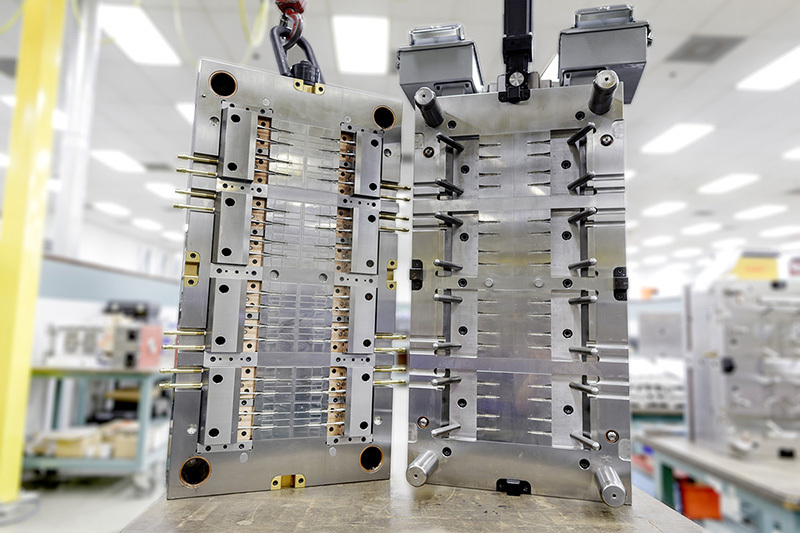 Here are a few issues to consider when designing molds for multicavity production. As cavitation is increased, the distance from the machine nozzle to the cavities increases. This results in a greater volume of resin in the hot runner manifold and, subsequently, longer residence times. For example, in a recent 32-cavity mold, the weight of the material in the hot runner system is 22 times the weight of all 32 parts combined. Eastman's guideline for design residence time with copolyesters is 5 minutes. Higher pressure losses through the runner system are typical of higher-cavitation tooling, because the increased distance from the machine nozzle to the cavities results in longer flow-length requirements for the resin. Eastman's guideline for maximum fill pressure for a runner/part/gate is 20,000 psi. Higher-cavitation tooling can make it more difficult to achieve cavity-to-cavity balance during the filling process. This can affect part quality and increase scrap rate. Recently, we solved this problem with a synchro-plate system that mechanically actuates all valve gates simultaneously. Contact Eastman for more details. Inadequate cooling and venting can result in high levels of residual stress and increased warpage. Increasing cooling channel diameters without maintaining velocity can actually result in a decrease in the total heat removed in a given channel. Some engineering polymers are very sensitive to mold finish, making mold polishing critical. In some cases, surfaces polished smoother than required for ejection only add to the mold cost. What's more, highly polished surfaces can create a vacuum in low-or no-draft areas and actually hinder ejection. You can see more information about mold design under either the MEDICAL or DURABLES tab above. TMI TIP: As always, early collaboration helps ensure best results from high-cavity molds. Watch this unique collaboration video. You can learn more about how Eastman is helping customers achieve optimal tooling, processing, and manufacturing results in the August 2015 issue of Plastics Technology.